How the new cycling hotel – with a cycling centre of excellence and museum – would look. For now the plans have been turned down. The hotel with cycling centre of excellence and cycling museum in Co Wicklow has been refused planning permission. 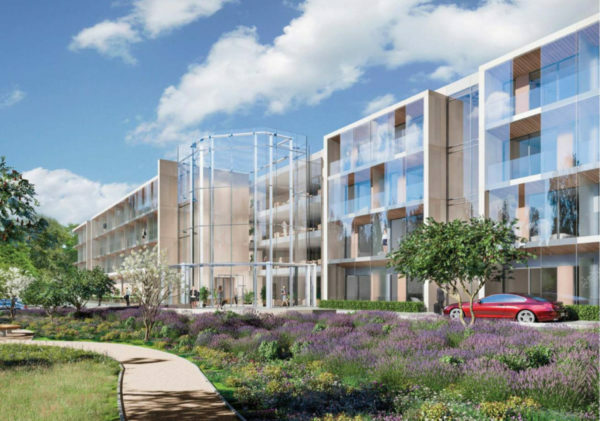 Property developer Johnny Ronan is behind the €50 million plan, which has been backed by Sean Kelly and Philip Cassidy. Ronan’s development company – Ronan Group Real Estate (RGRE) – made an application in 2016 to develop a 141-room hotel in Enniskerry, Co Wicklow. The area is a playground for cyclists, walkers, kayakers and others involved in adventure sports who flock to that part of Wicklow for activity holidays; travelling from all parts of Ireland and abroad. While the project is a hotel first and foremost, it was aimed at the international cycling market. It was intended to also contain the centre of excellent and museum of Irish cycling. Permission had been turned down by Wicklow Country Council and Ronan brought an appeal to An Bord Pleanála. It has just upheld the local authority’s refusal to grant permission, though the plans can be amended and lodged again. Johnny Ronan, third from left, with Sean Kelly – in blue second from right – at a cycling event in Spain where Kelly does his SportActive cycling camps. The just-published decision said of the cyclists backing the project: “Sean Kelly’s submission is that the hotel will accommodate a cycling Centre of Excellence for Ireland’s aspiring cyclists and the Sean Kelly team as well as a museum space. “St Valery’s is the only uncompromised option in terms of the site with access to an international airport and the diversity of local amenities in the area. “A similar letter of support is presented by Philip Cassidy another Irish champion cyclist, who also has expertise and a business in the tourist accommodation sector. The cycling market was “a legitimate niche market”. And in being backed by Kelly and Cassidy “the proposed development has the backing of cyclists who have a demonstrated track record at international level”. However, planning permission for the hotel was refused on three main grounds. An Bord Pleanála said the proposed development was very close to the M11-N11 road. Indeed, it noted the hotel and overall facility fell within the road’s corridor for future development. It had been decided nationally the development corridors or national roads that needed to be upgraded should be kept free of development. Because of that, granting permission for Ronan’s cycling hotel within the development corridor of the M11-N11 would be “premature” before the roads were upgraded. Secondly, while the area the new hotel was proposed for was zoned for tourism, this particular development was out of step with the surrounding area. The board concluded “a development of this nature would constitute an incongruous feature in the landscape”. Finally, permission was refused because the board was not satisfied the development would ensure the protection of St Valery’s; a stately home dating back to the early 1800s which is also a protected structure. While the mooted development was greeted by many local interests as a means of adding employment in the area and aim to target cycling as a tourism market was welcomed, these were not enough to outweigh the concerns of the board. There was some concern locally that the development may become one dominated by apartments. And worries about possible damage to the nearby river Dargle were also raised.